Are you passionate about birds? Interested in the beautiful and prolific birds of Southern Africa? This is your opportunity to own a best-selling bird poster that has given huge pleasure to a very large number of people. This poster is fully revised – which means it contains the “new” bird names. And it is only a couple of clicks away from you! 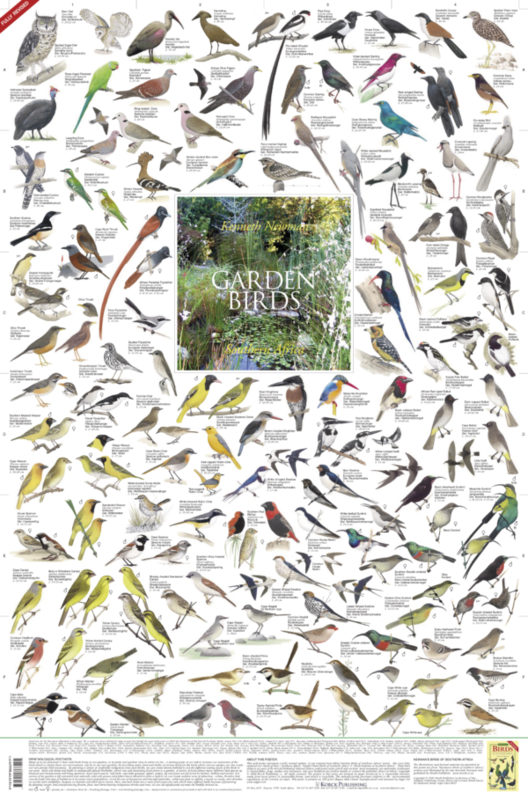 Illustrated on this poster are 107 bird species superbly illustrated by Kenneth Newman. Among the bird families represented are: barbet, bulbul, canary, crow, cuckoo, dove, flycatcher, kingfisher, mousebird, owl, pigeon, plover, prinia, robin, sparrow, starling, sunbird, swallow, swift, thrush, warbler & weaver. There are 20 other bird posters in the Korck Publishing Bird Poster series. “Garden birds – Southern Africa (Fully Revised)” is one of 36 beautifully illustrated natural history posters produced by Korck Publishing, South Africa, and available now, world-wide, at a price you can afford! The wall poster measures 900 mm x 594 mm (35.4 x 23.4 inches). The poster is double laminated (ie laminated both sides) for ultimate protection, and will be shipped to you in a sturdy postal tube. Many of our customers throughout the world choose to frame or blockmount the poster such is the quality and impact of the poster itself.